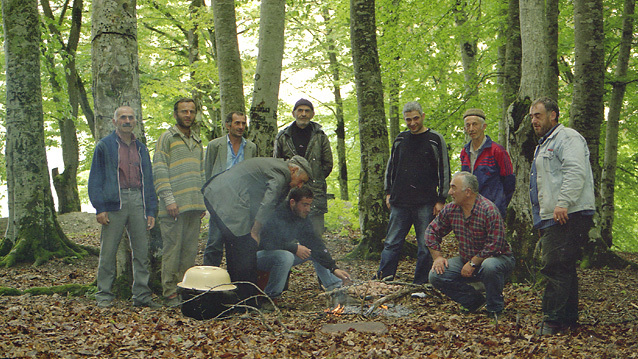 The men in the village, lead by Badri (squatting), my great father in law, arranged a big welcome party for me in the forest in Nikortsminda. Here the meet is being cooked. up making fun of he speeches anyway, so better keep them at home. They don't drink either. So this was male bonding the Caucasian way. We were twelve men in the forEst of Nikortsminda. Eleven understood each other but number twelve was without his female interpreter and was left to communicate via smiling, Gaomarchos'ing and eating. It's amazing how quickly men can understand each other just by using signs, grounches, smiles, nods and other bodily expressions. The thought have struck me that women in same situation would have been experiencing severe problems. Exessive amounts of food & wine. It's safe to say that the food was excellent. Prepared on open fire. And with some female pre production, the sauces and accessories were up to par with the most exclusive kitchens. 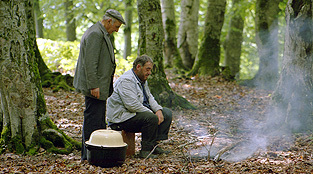 The meat pots were boiling mysteriously, and some pieces of pork fried in the ground on heated stones. Everything was in a way that could satisfy any stone age or modern man. We felt free and wild. The wild part I think had to do with the wine and the ice-cold fog that came creeping into the forest after a couple of hours. The challenge of being a non-drinker. At that point I had just finished the three hour long attempt of explaining WHY a grown up man don't drink. And especially wine. There could have been some serious problems here, but I think Badri finally made up a story about me having some life threatening illness causing death if I had any alcohol. 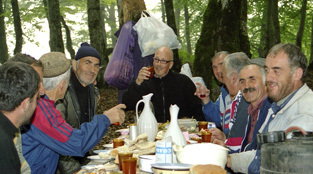 It is considered abnormal not to drink in Georgia. Something has to be said about the wine. As you maybe have noticed 60 liter of wine divided on 11 men is somewhat a lot. I still can't tell you how this is possible, but I saw it with my own eyes. Zviad is left alone watching the pig meat.